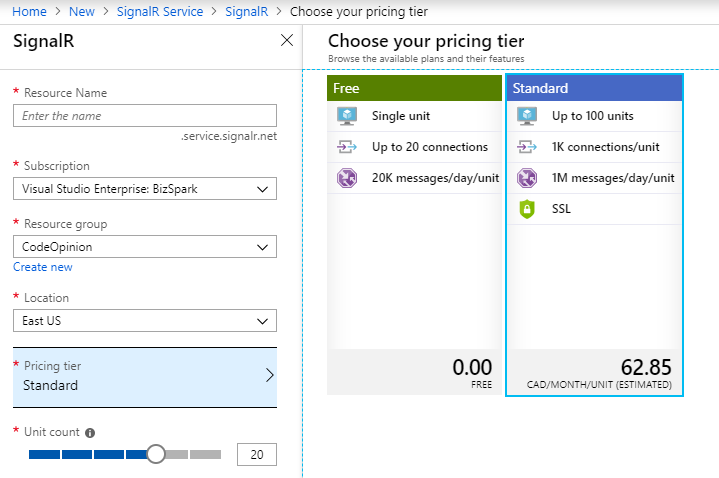 In this section, I’m going to cover how to deal with scaling SignalR by using the Azure SignalR Service. This is a managed service that is an alternative to using the Redis backplane that I’ve described in the previous section. You may want to use this option as it eliminates having to manage your own Redis instance as well as dealing with a load balancers configuration of sticky sessions (client affinity). Everything is all pre-configured for you, and is a fully managed service. 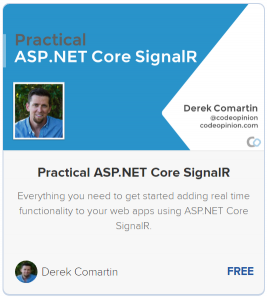 I’ve covered the basics of scaling in the previous section and how having a web farm poses problems when using SignalR. If you haven’t already or are need an overview of a webfarm scenario with SignalR, check out that section which covers how to scale using Redis as a backplane. 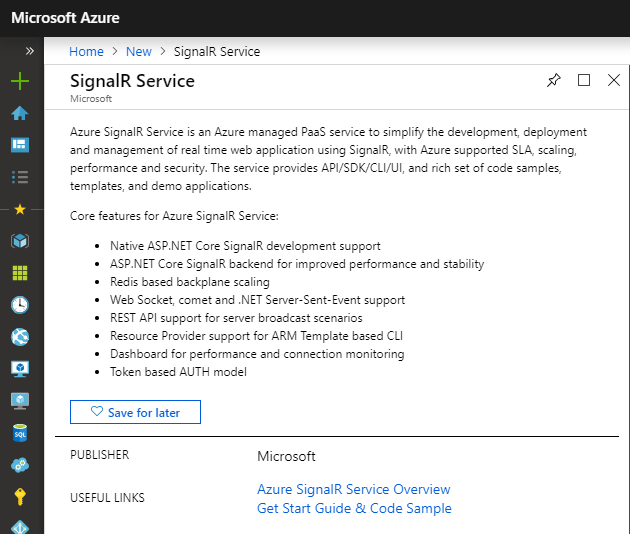 First thing to do is add a new resource in Azure by and search for the SignalR Service. As you are creating the new service, when selecting the pricing tier, note that the free tier does not support changing the unit count. Meaning you are limited to 20 connections and 20k messages/day. The standard tier gives you 1k connections per unit and 1M messages/day/unit and allows you to scale up to 100 units (depending on the region). First, you’ll need to reference the Microsoft.Azure.SignalR package in your csproj. 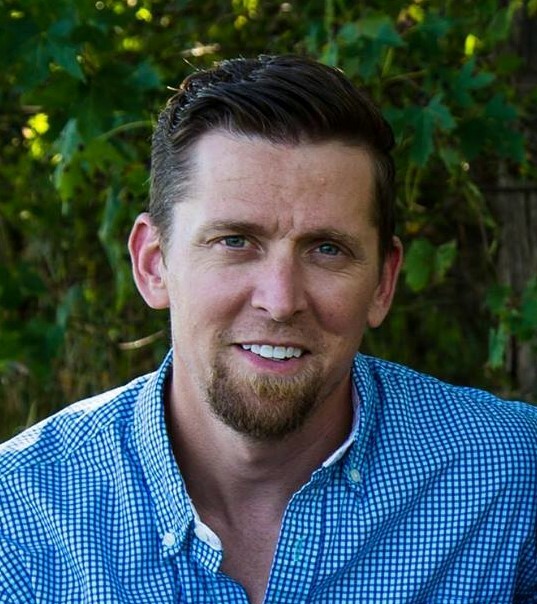 dotnet user-secrets set Azure:SignalR:ConnectionString "Connection String Goes Here"
If you’re unfamiliar with user secrets, check out my blog post on handling sensitive configuration data. That’s it. 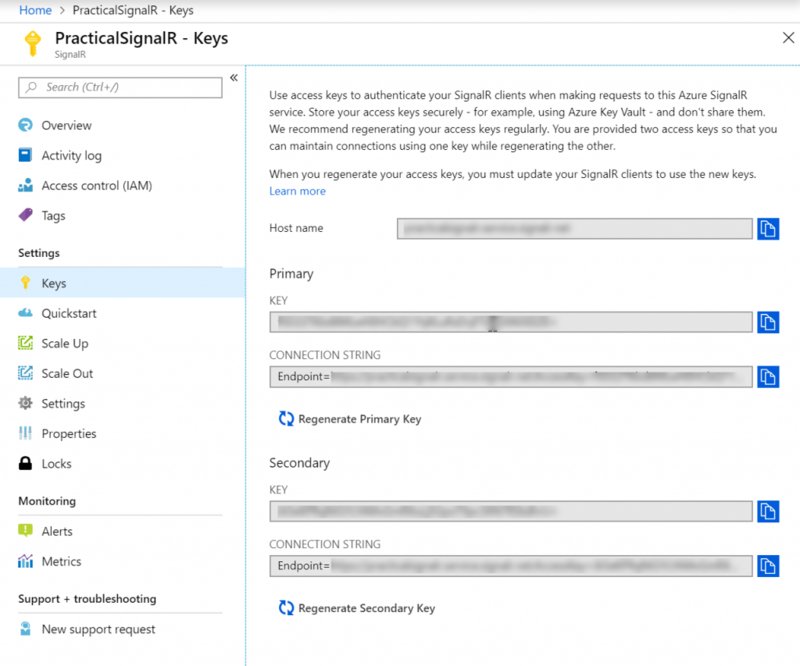 You’ll now be using the Azure SignalR Service and be able to scale to 1000’s of connections.